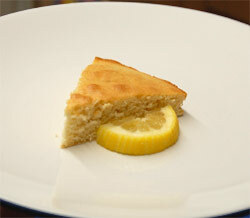 A slice of sponge cake makes a nice afternoon snack or a tasty desert after a low GI meal, this version has the added excitement of a lemony flavor. The overall GI of the cake is reduced by the use of ground almonds and butter, which like all fats reduces GI. Despite this fact it's relitively high sugar content means that it should only be eaten in moderation. 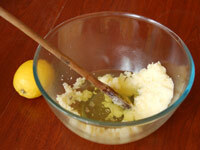 Beat the butter and sugar together using a wooden spoon or an electic mixer until it is white. Add the 5 egg whites keeping back 3 of the egg yokes to add later. 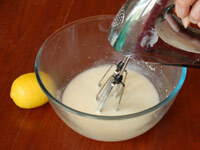 Whisk the egg whites with the butter and sugar until it is all mixed in. 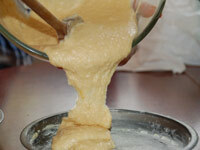 Continue to whisk the mixture to add some air making for a lighter cake. Grate the rind from half of the lemon then cut and juice the whole lemon. Add the lemon juice, rind, almonds, flour, baking powder and salt to the mixture along with the 3 egg yokes. Mix to a smooth paste with a wooden spoon. Grease two small cake tins with a little butter and dust them with flour. Pour the mixture equally into the two tins. Pre-heat an oven to 190°C/380°F/Gas Mark 5 and cook the cakes for 20 minutes. To avoid over cooking check them at 15 minutes. If they have taken on a golden color and make a hollow sound when tapped then they are done. The cake can be served as a desert with a few raw blue berries and a small amount of custard.